Whatever type or style of garden you will have is dependent on the site or location that you choose. Small or large, level or sloped, sunny or shady, swampy or dry, compacted or fresh and new; what space you have for gardening will affect what is possible for your garden. Vegetables, fruiting trees and shrubs need 6 to 8 hours of sun every day. An English-style perennial garden can get by with a little less. There is nothing wrong with a shade garden of hosta, fern, astilbe, and wild geraniums under the trees; in fact it is quite relaxing. Or how about pots of herbs and a few vegetables on the deck for easy access to pluck a few tasty tidbits to toss into your summer meal? Just as learning about your soil is the key to growing healthy plants, knowing your site is key to a successful garden. Assessing your site and collating your observations onto a site plan will form the heart of your garden plan. 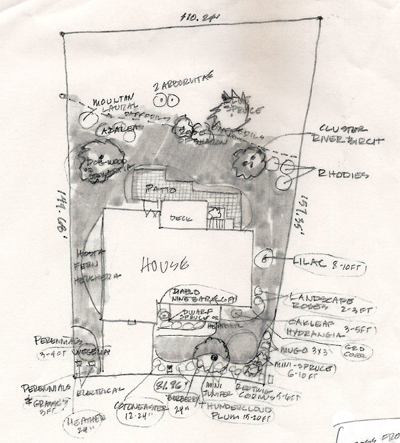 (A site plan is the aerial view of your yard, you can do a sketch yourself. It doesn’t have to win any artistic awards, it just has to be readable). Begin your site plan showing the current features of your garden site. It should show the outline of existing building structures; existing landscape features such as patios, play areas, driveways, and sidewalks; existing trees, shrubs, hedges and garden beds. Start with a sheet of paper, and take some measurements from your property line to any building structures, driveway and sidewalks from various points, the length of the sides of the house, etc. In no time you will have your existing site plan. Make several copies of this existing plan, or have some tracing paper to overlay the basic site plan. Once you have the basic plan, make notes as to changes in the level of the property, the direction of the prevailing wind, and the points of the compass. Once the basic plan is complete, you can begin to evaluate the location of existing gardens or look at locations for a new garden space. Be sure to pay attention to the direction of East, South, and West in selection of the location of your gardens for the most sun exposure. Pay attention to trees; they will grow taller and would cast shade onto the vegetable bed in just a few years. This is also the time to draw in any future buildings or hardscape (patio, pool, shed, deck) areas. You won’t want to have to move the garden when the budget allows for these future renovations. Lastly, make note of the soil types where you would like your garden: silty, loam, clay, wetlands, dry. This is the soil that you will want to send to the lab for testing. Make note of the location of the water source for your garden. Outdoor spigot, downspouts for collection of rain into barrels, or are you fortunate to have a well just for the garden? How far away is this resource from where you would like your garden; how will you get the water to the garden? American Horticultural Society Northeast Smart Garden Region Guide by Rita Pelczar and Trevor Cole, published by DK Publishing Inc. in 2003. Start with Part I, Chapters 1 & 2, and draw up your site. Check your library for this book but you may want to purchase your own copy for its long lasting value to you as a gardener. There are great photos for reference when we move on to selecting the right plant for each location. Still available through Amazon at low cost. The Vegetable Gardener’s Guide to Permaculture by Christopher Shein with Julie Thompson, published by Timber Press in 2013. Chapter 3 is Designing the Permaculture Garden. This book has many tips on creating your basic site plan and then creating an action plan for your new garden. The book is available in both e-version and hardcopy. We are recommending this book because of its value in creating a site plan for vegetable gardens and fruiting tree and shrubs.